Back around 1993, I had the exciting combination of a PowerBook 210 with a Duo MiniDock. It only had one port—not even a headphone jack—but an innovative docking connector meant I could hook it into a full-fledged desktop setup with an external monitor, hard drives, and network. The OWC dock has a panoply of networking and peripheral ports that come close to matching what you find on a current Mac mini model (it’s shy one monitor-capable outlet compared to the mini). Plug a short USB-C male-to-male charging-compatible cable from a MacBook to the appropriately labeled port on the AC-powered dock, and the world opens up to you. The dock works in OS X and with Windows 10 via Boot Camp. Let’s start with the port rundown. 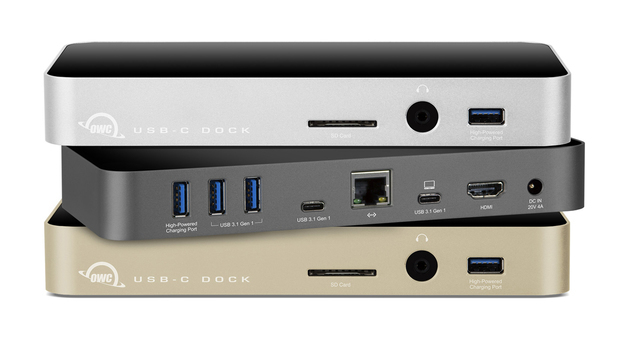 The USB-C Dock features five USB ports, one gigabit ethernet jack, an SD card slot, an analog headphone/microphone combo jack, and an HDMI 1.4b port compatible with DisplayPort, which can handle displays up to 4K/30 Hz. The audio, memory card, and one Type-A USB port are arrayed along the front. The rest of the ports and the DC-power jack are on the back. The dock comes with a 4-foot cord attached to a power brick with a removable 4-foot AC cord. Recent iPhones can charge up to 2.1 A and iPads can charge at 2.1 A or up to 2.4 A with newer units. The 0.9 A and 1.5 A limits on the dock’s ports seem a little below ideal, and I think using “high-powered” with a port that delivers less than 2.0 A stretches the definition. OWC built USB 3.1 Gen 1 into all five of its USB connections, which handles a 5 Gbps rate. It’s effectively USB 3.0 with a few minor improvements. The 10 Gbps Gen 2 isn’t widely in the market yet, and the MacBook only handles Gen 1. The headphone jack appears as external named input and output sources, so plugging in headphones doesn’t automatically switch the Mac to play audio through the dock—you have to make a manual selection. The dock is eminently self-explanatory with one exception. While there are two USB-C ports, one is designated for the MacBook. It’s labeled with a relatively large white silkscreened laptop icon above it. If you plug into the other USB-C port, the Dock doesn’t work. On a couple of occasions, despite that icon, I plugged into the wrong port and thought something was wrong with the dock or peripherals. In practice, I expect most users will keep the host cable plugged into the dock, and only plug and remove the MacBook, making this a moot point. The dock measures 7.9 x 3.5 x 1.1 inches, allowing you to tuck it at the feet of a monitor. It’s just 0.9 pounds, making it reasonable to stick into a bag, especially if you keep the slim box that it and its power adapter come in to keep it manageable. Where the dock comes up short is with the 18-inch host cable required to attach it to a MacBook. This is almost comically short, especially since it has to reach from the MacBook to the back of the dock. A 3-foot or even 4-foot cable should have come with it, and that’s a tricky thing to replace because not all USB-C cables are rated for passing more than 15 watts (W) of power. The MacBook’s own adapter runs at 29 W, and the cable Apple ships can carry that. OWC may be trying to minimize cost here, but it’s the wrong place to shave dollars. You can buy from OWC a 3-foot cable for $19 or a 6-foot cable for $29. Although the ports in the back are the ones you’ll use less, the combination of a short cord and the placement of the sole USB-C peripheral jack there makes the dock a little more awkward than it needs to be. The UHS-I 40 MBps SD Card slot can accept cards up to 2TB, but it underperforms. Using a 45 MBps-rated SDHC card that outside tests confirm handles nearly that rate, I measured 17 MBps writing to the card and 20 MBps reading. However, using a generic card reader plugged into the MacBook directly via Apple’s USB-C to Type-A adapter, the card wrote at 27 MBps and read at 36 MBps. I discussed this with OWC, and they don’t have an explanation; they’ve tested identical cards and hit the bus-limited 40 MBps maximum performance. Because the card reader shares the USB bus, they would expect potentially diminished performance if other heavy-duty tasks (like ethernet networking or hard drive transfers) were underway, but my testing happened in isolation. In practice, that slight difference will be unnoticeable. The gestalt is part of what makes the dock worthwhile, and its $159 list price seems perfectly reasonable given the set of ports, capabilities, quality of design, and OWC’s reputation and history of hardware manufacture and customer support. If you own a MacBook already and need a fully fleshed-out desktop environment, the OWC USB-C has the current status of being the only option and a very solid one. If you haven’t purchased a MacBook yet and can wait, it’s worth looking at Apple’s next laptop releases. Thunderbolt 3, which will use USB-C as its connector type, is due out later this year and is already announced for a special Dell developer edition laptop model. Apple’s roadmap is unclear, but it’s likely we’ll see a revised MacBook at the March 21 event or in April, as the first model appeared just over a year ago; it’s just possible it’ll have Thunderbolt 3 included. Other MacBook models will likely see updates this year, too, and Thunderbolt 3 is a natural for the Pro. And a separate issue is that while the OWC USB-C Dock is first to market designed for the MacBook and checking off all the useful adapter boxes, you may be able to get a higher-performance dock in the next few months—but also at a higher price—that includes higher-amperage (faster) USB ports, more USB-C ports, and native DisplayPort or multiple monitor jacks. If you’re ready now or the feature set meets or exceeds your needs, there’s no reason to wait: The USB-C Dock neatly extends a MacBook to act like a desktop. « Mingis On Tech: Apple events, iPads and smartphones, oh my!